Take a step back. 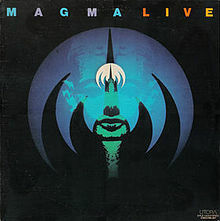 A French progressive rock band formed in the late 1960’s, influenced by jazz of that period, Wagner, and Orff, singing in a made-up language over album-length tracks, and often featuring at least 7 or 8 members in its lineup. The chances of that group still going strong in 2015 is…negligible? Not for Magma. 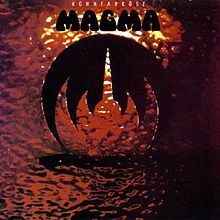 While born in the early “prog” era, Magma has transcended that label, and is responsible for not only influencing dozens of bands (Univers Zero, Art Zoyd, Happy Family, Eider Stellaire, Eskaton, Sotos, etc. ), spinning off several others (Weidorje, Zao, etc. ), and created a unique category of music (Zuehl). 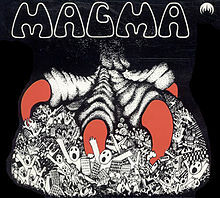 Since the late 1990’s, the group, lead by founder Christian Vander, Magma has reemerged with a string of studio and live albums of a quality that matches that of their earlier era. In the course of this album, the band tells the story of a group of people fleeing a doomed Earth to settle on the fictional planet Kobaïa. 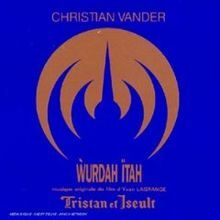 Ẁurdah Ïtah was originally released as a Christian Vander soundtrack for Yvan Lagrange’s 1972 film Tristan et Iseult. 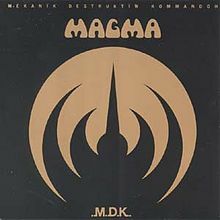 It was re-released on Seventh Records in 1989 as a Magma album. 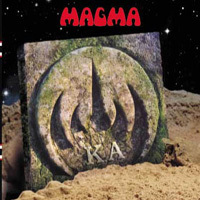 Magma‘s first full studio album in 20 years, K.A. (short for Köhntarkösz Anteria), is a reminder that the modern version of the band is at least as powerful as the 1970-78 lineups. Despite the new band members and different instrumentation, K.A. was mostly composed in the mid-1970’s, and harkens back to that era. Consisting of three long tracks aptly titled K.A. I, K.A. II, and K.A. III, the album features epic compositional themes, multi-part vocals, and a jazz-inflected prog-rock approach. Nonetheless, Magma is Magma, and ultimately only resemble themselves. Unlike their 1970’s recordings, K.A. does not involve horns or much dissonance, but includes long jams. Vocal interplay and counterpoint, as well as swirling instrumental dynamics are the focus. The vocals are catchy, melodic at times, but never mundane. K.A. I kicks off with a representative vocal-heavy approach, featuring the two male and three female singers taking turns in lead and harmony roles. Guitar and keyboards follow or compliment the vocals, while Vander and Bussonnet provide busy rhythms. K.A. II is perhaps the most memorable piece, as it features a long section of soulful, urgent call-and-response vocal patterns, followed by an instrumental section. K.A. III is more obviously in the prog-rock camp than the other tracks, as it features a long keyboard solo, as well as several distinctive vocal themes. I won’t be shy – K.A. 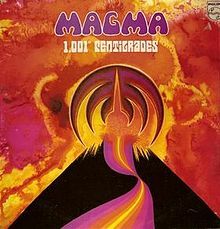 is my favorite Magma album of them all. It is the recording that I keep coming back to when I feel the urge for something Kobaian. Vander and company outdid themselves on this recording and created a desert-island classic. 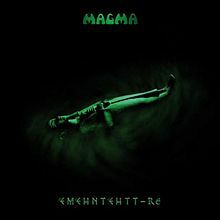 Magma’s second studio album since their rebirth in the late 1990’s, Ëmëhntëhtt-Ré is a combination of studio and live pieces that the group has been playing since the mid 1970’s. For instance, Ëmëhntëhtt-Ré I combines Ëmëhntëht-Rê (Announcement) from the Live/Hhaï and Rindë (Eastern Song) from the Attahk, while Ëmëhntëhtt-Ré II combines Ëmëhntëht-Rê (Extrait n’ deux) and Zombies (Ghost Dance) from Üdü Ẁüdü, as well as Hhaï from Live/Hhaï. Nonetheless, the recording on this release are a reworking of those older compositions, with new material and a more modern approach. Particularly, Antoine Paganotti is replaced as lead male vocalist with Hervé Aknin, and Benoît Alziary on vibraphone is added. The centerpiece of the recording is the 22-minute Ëmëhntëhtt-Ré II, which features a powerful vocal workout from Aknin and female leads Stella Vander and Isabelle Feuillebois. Notably, the song structure is both deceptively complex, but contains no shortage of catchy hooks. The last third of the song exhibits new versions of the pieces from Üdü Ẁüdü, in the form of chants. Ëmëhntëhtt-Ré III, the other long piece, initially slows the tempo to an intense simmer, before building up to a crescendo. 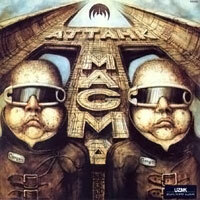 Like many Magma tracks, the vocals serve as additional instruments, rather than vehicles for words per se. The remaining shorter tracks round the album out, with Ëmëhntëhtt-Ré I both Funëhrarïum Kahnt both containing dirges. As a consequence, Ëmëhntëhtt-Ré is darker than 2004’s K.A., but no less vital. 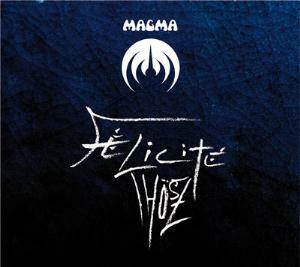 Félicité Thösz is a departure of sort for the modern Magma lineup. While featuring guitar and vibraphone, the album squarely revolves around vocals, piano, bass, and drums. Further, the thirty-minute title track is a suite of shorter songs. The longest of these, Tëha, is the most memorable with compelling melodies and lead singing by Stella Vander. While each track has a beauty of its own, the epic feel of a Magma composition is largely missing. A notable exception would be Tsaï!, which features a violent vocal chant over an intense theme performed by the entire group. Les Hommes Sont Venus, which is not part of the Félicité Thösz suite, is almost a pure vocal piece, with some bells in the background laying down a simple repetitive rhythm. 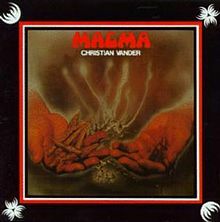 Apparently, Christian Vander was never satisfied with the original 21-minute arrangement of Rïah Sahïltaahk that appeared on 1971’s 1001 Degrees Centigrades. Thus, over 40 years later, he set out to rectify the situation. And the result? There are plenty of familiar passages throughout this 24-minute version. However, Vander has broken up the original single-track piece into seven separately-named tracks. Also gone are the horns of the 1971 recording, notably the distinctive bass clarinet of Yochk’o Seffer. In the place of the brass and woodwinds, we get guitar, vibraphone, and female vocals. All in all, not a bad tradeoff. But when listened back-to-back, a few textual differences become apparent. The 2014 version is tighter, less jarring, and not as abrupt or shrill. This is probably due to the said lack of horns, as well as Klaus Blasquiz not taking part in the recording. In the balance of Vander’s influences, Coltrane wins out over Wagner, despite omission of the saxes. Also, due to modern technology, this EP has a cleaner, clearer mix than the original. 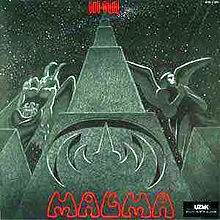 Regardless, the soulful joy that is Magma at its best shines through into the digital era. One of the band’s better efforts of their modern incarnation. 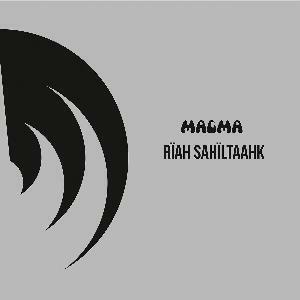 Magma is back with its second EP release in three months. 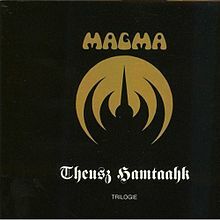 Following rapidly on the heels of the re-recording of Rïah Sahïltaahk, Slag Tanz once again features the modern Magma lineup performing music reminiscent of their arrival on this planet 45 years ago.